I had the once in a lifetime experience of meeting Diane von Furstenberg at an event at her South Coast Plaza store . She is one of my all time favorite designers (more about my meeting with her in an upcoming blog post). So for Friday Favorites this week I wanted to honor her by sharing with you some of my favorite pieces from DVF. DVF is probably most known for her inconic wrap dress. It comes in many different colors and patterns and I swear, it looks good on everyone. I also love this Layla Burnout dress. It is my personal favorite (and Diane's too). DVF also makes amazing accessories like this adorable purse and these fabulous snakeskin boots!!!! I am so honored to have had the opportunity to meet Diane and I will treasure this memory forever. I can't wait to share with you more to my unbelievable night. So stay tuned. And don't forget to follow me on Instagram, Facebook and Bloglovin. Happy reading!!!! I love the color olive green for the fall. It reminds me of the leaves falling off the trees and the richness of the fall season. 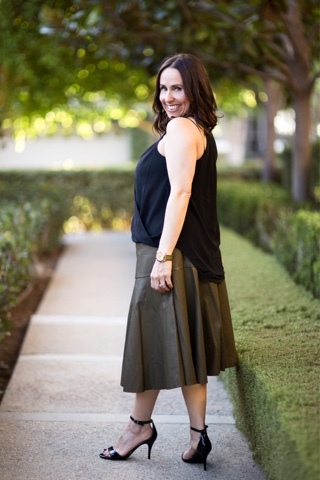 I found this adorable olive colored faux leather skirt at Nordstrom and knew I had to have it. I love that the cut is so unique and I especially love the pleats. I decided to pair it with a great black tank top from VICI. I then added my Steve Madden open toed heels and my favorite Kendra Scott necklace and my outfit was complete. 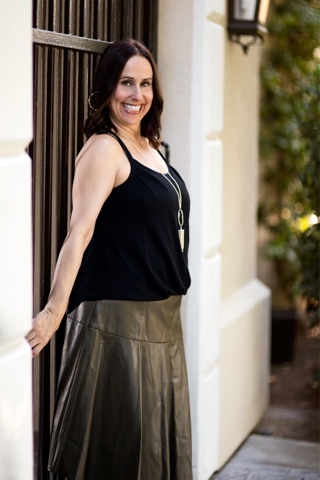 I love finding that special piece in that special color like olive green and creating my outfit around that piece. What do you have in your closet that you can create a whole look around? I would love to hear about it. Thanks to Gabi Wells for photos and don't forget to follow me on Instagram, Facebook and Bloglovin. You can shop the look below by clicking on the pictures. Happy reading!!!! Every girl needs a perfect denim shirt. (Maybe even more than one, but don't tell anyone). I wear mine all the time!!! Over a cute dress, with jeans ( I really love the denim on denim look right now-- it's so on trend), or a cute pair of khakis. A denim shirt is so versatile and I recommend you absolutely invest in one. I love this version from Current Elliot. It is so cute and I especially love the snaps, but it carries a hefty price tag of $228.00. I also love this version from Topshop. It fits perfectly and has a price point of only $38.00. So whichever version you prefer, try adding the perfect denim shirt to your fall wardrobe. I promise you will wear it all year long!!! Don't forget to follow me on Instagram, Facebook and Bloglovin. 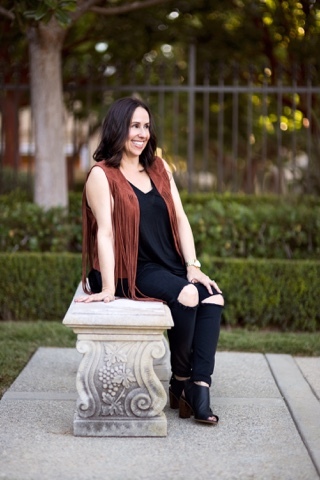 Happy reading and you can shop the look by clicking on the pictures below!!! 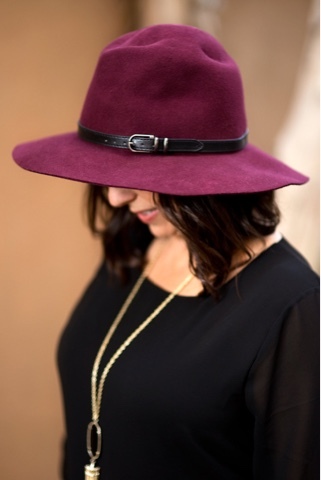 One of my favorite accessories for the fall are hats. Hats are fun and you can coordinate them with all of your outfits. 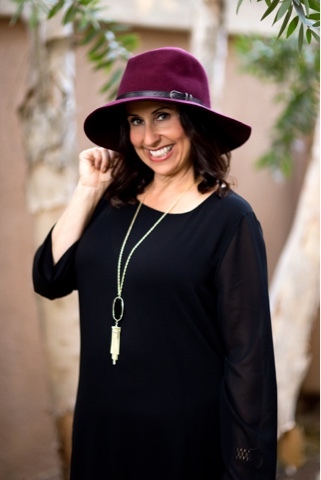 There are so many different options and styles of hats to choose from. There are beanies, floppy hats, fedoras and multicolored hats. 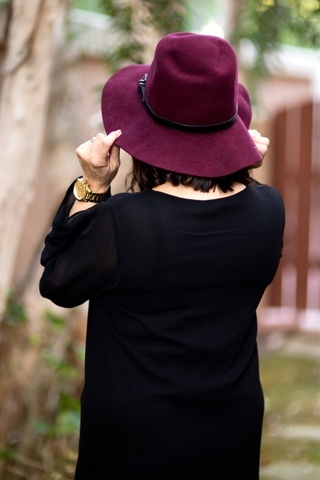 I love a great basic black hat, but try adding color with a camel or burgundy hat!!! Whatever option you choose, I highly recommend investing in a great fall hat. Which are your favorites? Don't forget to follow me on Instagram, Facebook and Bloglovin. Happy reading and you can shop the looks by clicking on the pictures below!!! Happy Thursday!!!! Today's beauty find is my favorite fall nail polish colors. I love coordinating nail polish with the seasons and these fall colors are my absolute favorites. Fall reminds me of deep red and burgundy nail colors. Since Halloween is right around the corner I also love adding black (especially on my toes) and this fabulous dark gray. What are your favorite fall nail polish colors? I would love to hear about them in the comment section. Don't forget to follow me on Instagram, Facebook and Bloglovin. Happy reading!!!! You can shop the look by clicking on the pictures below!!! The Mint Julep Boutique. 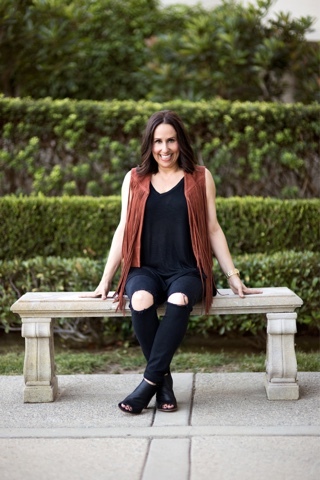 It is one of the fastest growing online women's retailers in the United States. The Mint carries such adorable pieces and this Spellbound the Night Dress is one of my favorites. When this fabulous dress arrived in the mail, it was love at first sight. 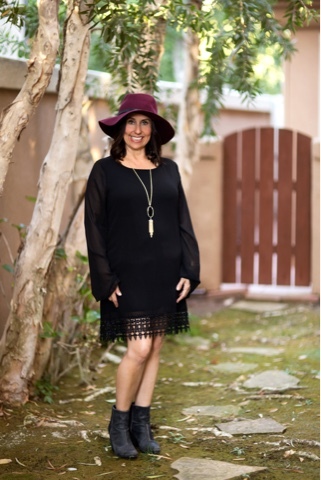 And when I put it on and added my cute burgundy floppy hat, Rag and Bone booties and Kendra Scott necklace, I was ready for a night out on the town. If you re looking for that special something I highly recommend checking out The Mint Julep Boutique!!! I promise you will find the most fantastic pieces at reasonable prices. Stay tuned for an announcement featuring the Mint for Everything Evelyne readers!!!! I can't wait!!! Thanks to Gabi Wells of A Little Sweet Life for photos and don't forget to follow me on Instagram, Facebook and Bloglovin. Happy reading!!!! I think my favorite fall/winter piece is the faux fur vest. It is so chic and on trend. I love pairing mine with a great blouse, some skinny jeans and boots. It is so versatile and also goes great over dresses. I love this splurge version from Trina Turk. The multicolored print is to die for!!! But it has a hefty price tag of $395.00. I think you can achieve the same look from this Topshop version. This is my personal favorite. I wear it with absolutely everything. It is one of my go to pieces and it is only $125.00. Whichever you choose just try out a faux fur vest this season. I know you will be in love!!!! Happy reading!!!! Dont forget to follow me on Instagram, Facebook and Bloglovin. You can shop the look by clicking on the pictures below!!! 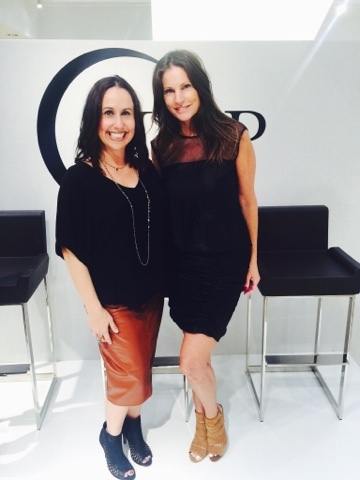 A few weeks ago Cathy and I were lucky enough to attend The Neiman Marcus CUSP event hosted by my very dear friend Alyssa from Living in Style OC. 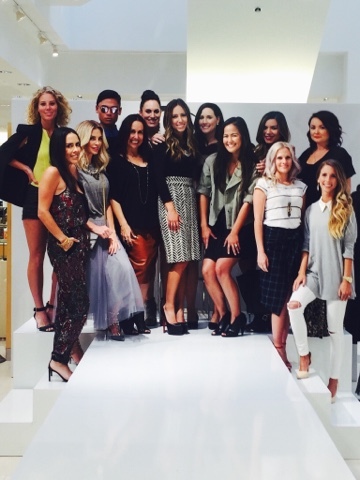 This was an amazing fashion event that showcased all upcoming fall fashions. The best part of this runway show was that all of the looks featured focused on mixing and matching textures and prints. I loved that everything goes!!!! There were no rules and so many fun options to try out this season. Some of my favorites looks incorporated faux fur (from my friend Yvonne's line N:Philanthropy) reds, fringe, plaid, flared jeans and white. 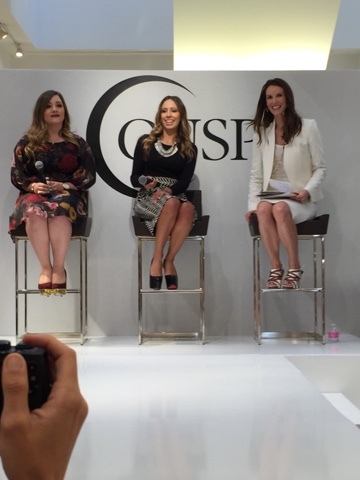 Neiman Marcus CUSP has so many different on trend looks. 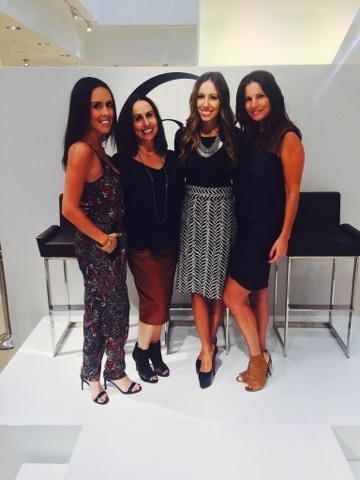 I also had the best time hanging with my blogger babes!!!! Alyssa did a fabulous job and I can't wait to try out some of these looks myself. Which are your favorite looks? Don't forget to follow me on Instagram, Facebook, Twitter and Bloglovin. Happy reading!!!!! I just love booties. I wear them all year long, but I especially love them for the fall. There are so many different types of booties that are on trend this fall. I love the western style, this new clear block heel style, the fringed skinny heel bootie and the colored bootie (especially in red). But my favorite is this printed black and white version. Whichever booties you prefer, try to choose a pair that is an alternative to traditional black. And remember, have fun with your booties!!! I can't wait to hear about which are your favorites. Don't forget to follow me on Instagram, Facebook, Twitter and Bloglovin. Happy reading!!! You can shop the look by clicking on the pictures below!!! Happy Thursday!!!! For today beauty finds I want to show you some things you can incorporate into your beauty routine that are in the fall color plum/berry. I love this color for fall, so why not add it to your makeup routine in addition to your wardrobe. I love a great deep plum lip pencil or gloss nail polish. And this Philosophy Berry Tart shower gel and lotion smells amazing. So add some berry into your fall life. Let me know what products are your favorites. You can shop the items by clicking on them below. Don't forget to follow me on Instagram, Facebook, Twitter and Bloglovin. Happy reading!!!! I have said it before and I'll say it again. 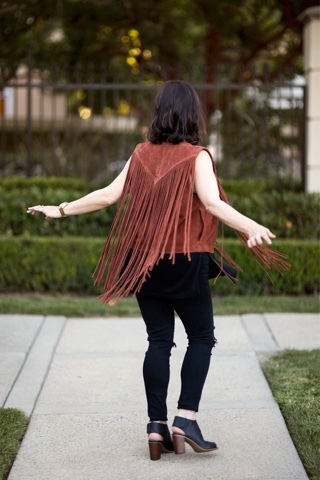 I am absolutely head over heels obsessed with fringe and suede. I loved this suede vest by Topshop. It is such a statement piece for the fall. It is so versatile and the camel color is so on trend for the season. 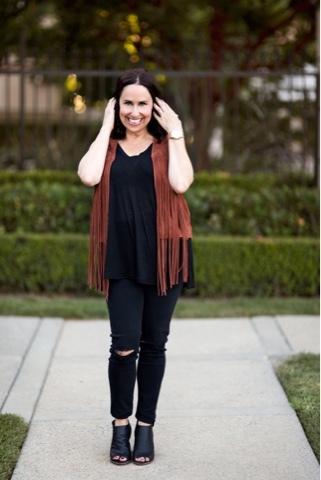 This vest has it all: perfect length, color and fit. I decided to keep the rest of this outfit simple. I always recommend to have one statement piece and pair it with the most basic options. I added a simple black tank, some distressed black denim skinnies and my peep toe Steve Madden booties. I love the simplicity of the rest of the outfit. 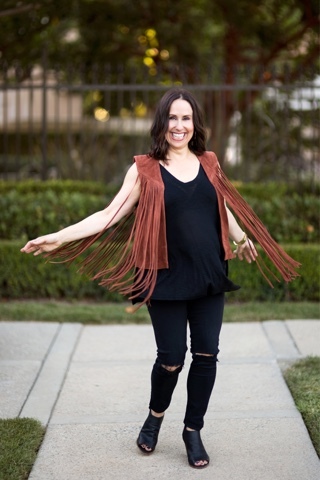 It really makes this fringe suede vest do all the talking!!!! I hope you think about getting on the fringe and suede train. It is so popular for fall. Thanks to Gabi Wells for photos and don't forget to follow me on Instagram, Facebook, Twitter and Bloglovin. Happy reading!!!! 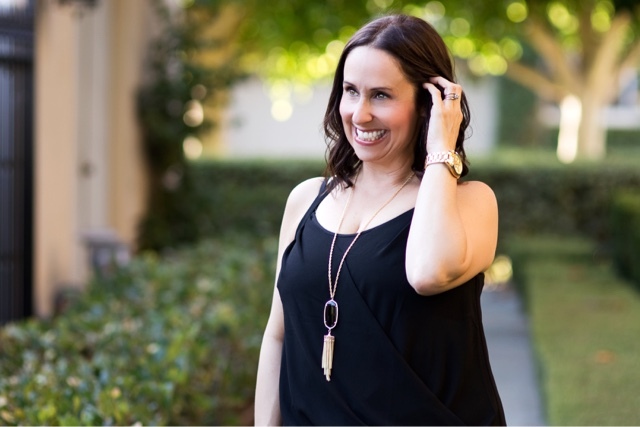 You can shop the look by clicking on the pictures below!! !